Some of you know just how nerdy my nerdy side is. I LOVE records. I like to track it all; from a detailed, color coded family calendar to an egg laying chart where I can mark when each of our 14 hens and 8 ducks lays an egg. And, yes, I do mostly know whose egg is whose! When we sent our two does to be bred I was assured that all would be monitored and watched. A doe will only stand still for the deed when she is able to get pregnant. If she doesn’t get pregnant on that cycle then 21 days later she will go into heat again. The young lady who owns the buck told me that he would be wearing a breeding harness. The harness, being loaded with orange chalk, is strapped to the buck’s chest and would make an orange mark on the doe’s back once she’s bred. 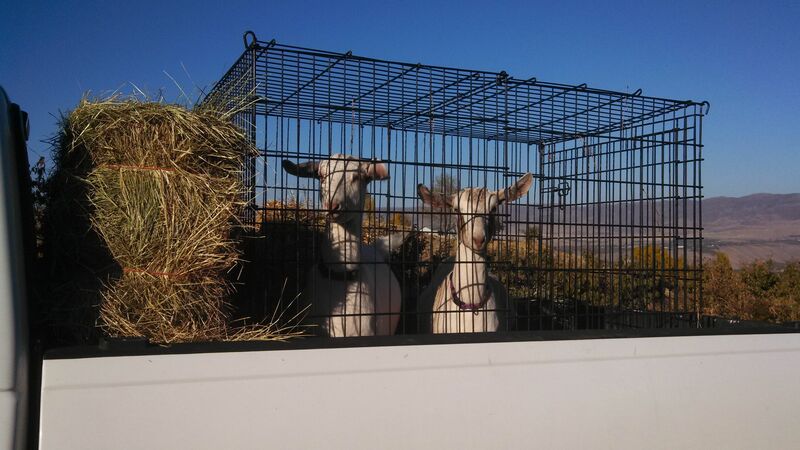 Piper and Nina were delivered to the buck on October 16, 2013. The short story is that the young lady kept no records and I picked up my goats on November 30th just hoping they were at least bred. I didn’t figure out they were pregnant until February 9th when I felt Nina’s baby move inside her. The next day I could feel Piper’s baby moving, too. So, now we are waiting. I’m reading lots of articles like “8 Signs that Your Goats May Be In Labor“, and checking the girls daily. I feel their babies move and check their udder. If it fills up with milk I’ll be able to tell the difference from how it is now. I’m also checking their ligaments that run diagonally from their back bone alongside their tail. Check out Fias Co Farm’s Prenatal Care article if you are interested in learning more. It’s awesome. Let me tell you, though, it would be really nice to have a due date. Like, I’d pay $40 for each goat for that. Oh, wait. I did. Grrrrr. At first not having due dates was just annoying but recently I had to decide if it was safe to make a quick trip to Calgary to go wedding dress shopping with my sister. Ultimately I decided to do it because my husband will keep an eye on things and he’s more than capable. Anyhow, here’s to baby goats and fresh milk. I can’t wait! This entry was posted in Goats, Happenings. Bookmark the permalink. If you can feel the babies moving (on right side of doe) they won’t come for at least 12 hours. The tailhead-to-pinbone ligaments will soften 24 hours before kidding.